Flow diagram of patient inclusion. ICU: intensive care unit. 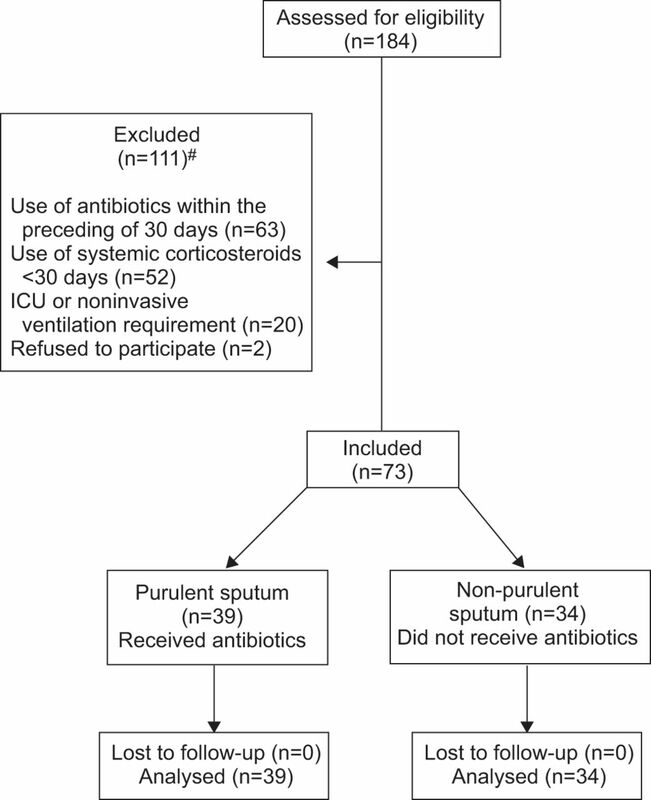 #: patients could have more than one exclusion criterion; excluded: purulent n=60, non-purulent n=51. Serum a) C-reactive protein (CRP) and b) procalcitonin (PCT) values at admission and day 3 of hospitalisation. #: p=0.07; ¶: p=0.006; +: p=0.01; §: p=0.88; ƒ: p=0.32. 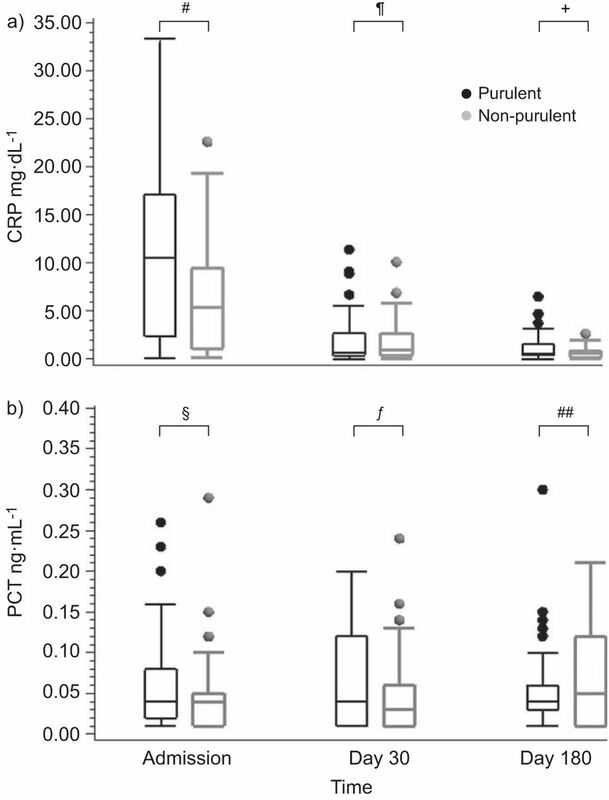 Two-tailed p-values shown for comparison of CRP levels between the purulent and non-purulent group, and between admission and day 3. Serum a) C-reactive protein (CRP) and b) procalcitonin (PCT) values at admission, day 30 and day 180 of follow-up. #: p=0.006; ¶: p=0.91; +: p=1.0; §: p=0.88; ƒ: p=0.31; ##: p=0.27. 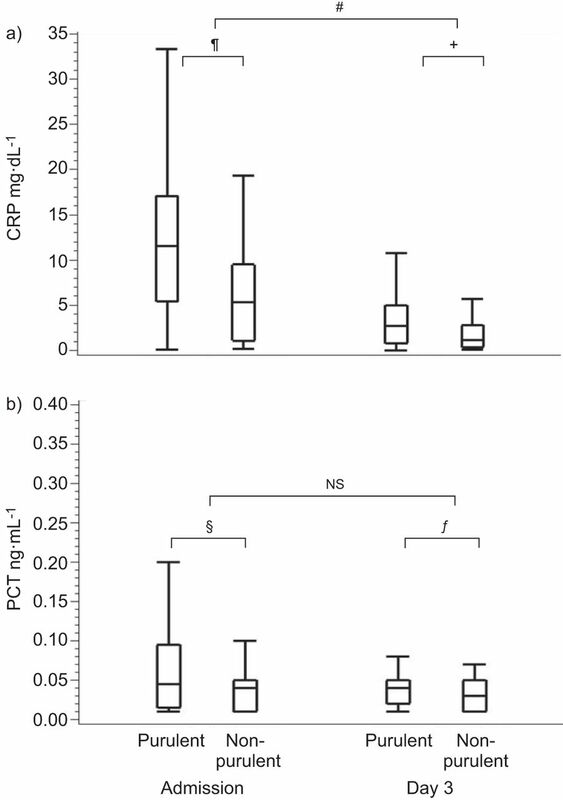 Two-tailed p-values shown for comparison of CRP levels at admission and day 30 and day 180. Data are presented as least square mean (LSM) or LSM±se, unless otherwise stated. FEV1: forced expiratory volume in 1 s; FVC: forced vital capacity.